The 144th Fighter Wing (144 FW) is a unit of the California Air National Guard, stationed at Fresno Air National Guard Base, California. As part of the Air Reserve Component of the United States Air Force, the wing is operationally gained by the Air Combat Command. The 144th Fighter Wing's primary federal mission under Title 10 USC is to provide air defense protection for California and the United States from the Mexican border to Oregon utilizing the F-15 Eagle jet fighter aircraft. In its state mission under Title 32 USC, the 144th also supports the nation's Counter Drug Program and responds to state emergencies when requested by the Governor of California. The wing previously flew the F-16C and F-16D Fighting Falcon, having transferred the last F-16C aircraft to the Arizona Air National Guard in November 2013. The wing's current inventory of aircraft includes 21 F-15Cs and F-15Ds and consists of 18 Primary Aircraft Authorized (PAA) and 3 Backup Aircraft Inventory (BAI) that were previously assigned to the Montana Air National Guard, Missouri Air National Guard and Nellis Air Force Base. The wing also operates one C-26A transport. Activated in October 1943 as the 372d Fighter Group at Hamilton Field, California. During World War II, the squadron was an Operational Training Unit (OTU), equipped with second-line P-39 Airacobras and P-40 Warhawks. Its mission was to train newly graduated pilots from Training Command in combat tactics and maneuvers before being assigned to their permanent combat unit. Initially assigned to IV Fighter Command, then transferred to III Fighter Command in 1944, being re-equipped with P-51D Mustangs. It took part in air-ground maneuvers and demonstrations, participating in the Louisiana Maneuvers in the summer of 1944 and in similar activities in the US until after V-J Day. The wartime 372d Fighter Group was re-activated and re-designated as the 144th Fighter Group, and was allotted to the California Air National Guard, on 24 May 1946. It was organized at Naval Air Station Alameda, California, and was extended federal recognition on 2 June 1948 by the National Guard Bureau. The 144th Fighter Group was bestowed the lineage, history, honors, and colors of the 372d Fighter Group and all predecessor units. The Group was assigned to the California ANG's 61st Fighter Wing. In 1949, the 144th and its assigned 194th Fighter Squadron moved from NAS Alameda to the former Hayward Army Airfield, designated as Hayward Air National Guard Base. At the end of October 1950, the Air National Guard converted to the wing-base (Hobson Plan) organization. As a result, the 61st Fighter Wing was withdrawn from the California ANG and inactivated on 31 October 1950. The 144th Fighter Wing was established by the National Guard Bureau, allocated to the state of California, recognized and activated 1 November 1950, assuming the personnel, equipment and mission of the inactivated 61st Fighter Wing. The 144th Fighter Group was assigned to the new wing as its operational group with the three fighter squadrons. 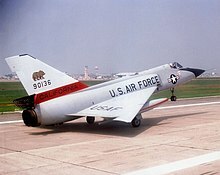 194th Fighter-Interceptor Squadron McDonnell F-4D-26-MC Phantom II, AF Ser. No. 65-0588, now on static display at Fresno Air National Guard Base. With the increased availability of jet aircraft after the Korean War, the squadron's aircraft were upgraded from the piston-engine, propeller driven F-51H to its first jet aircraft, the F-86A Sabre Day Interceptor in 1954. At the same time, the 194th relocated to Fresno Air Terminal, followed by the wing in 1957. On 7 July 1955, the 144th was re-designated as the 194th Fighter-Interceptor Wing, a designation kept by the squadron for the next 37 years. With the F-86A, the 144th began standing dusk-to-dawn alerts, joining its active duty Air Defense Command (ADC) counterparts, with ADC operationally gaining the 144th within the active U.S. Air Force under Title 10 USC. The 194th continued to fly the F-86A until 31 March 1958. On 1 April 1958, the transition was made to the F-86L Sabre Interceptor, which was designed from the onset as an interceptor, had all-weather capability and was able to be used in all weather. In addition, the F-86L could be controlled and directed by the SAGE computer-controlled Ground Control Interceptor (Radar) sites which would vector the aircraft to the unidentified target for interception. In 1958, the Nevada and Utah Air National Guard were authorized to expand to a Group level. The 152d Fighter-Interceptor Group, Nevada ANG, was federally recognized on 19 April 1958; the 151st Fighter-Interceptor Group, Utah ANG, on 1 July 1958. With Nevada and Utah forming their own command and control structure, command and control of the 191st and 192d FIS were transferred to their state organizations. On 1 July 1964, the 194th began flying the F-102A Delta Dagger, a Mach 1.25 supersonic interceptor. In January 1968, Air Defense Command was renamed Aerospace Defense Command, and continued to maintain operational responsibility. On 25 July 1974, the 194th retired the F-102 and brought the improved F-106 Delta Dart into service, continuing to fly this aircraft until 31 December 1983. On 1 October 1978 Aerospace Defense Command was inactivated, its units being reassigned to Air Defense, Tactical Air Command (ADTAC), a sub-element of Tactical Air Command (TAC), with ADTAC being established as compatible to a Numbered Air Force under TAC. TAC later replaced the aging F-106s on 1 January 1984 with F-4D Phantom IIs for use in the air defense interceptor mission. On 6 December 1985, ADTAC was disestablished and its role and responsibilities assumed by the reestablished First Air Force, a TAC organization which assumed operational oversight for all Air National Guard fighter units assigned to the air defense role. The 144th Fighter-Interceptor Wing received their first F-16A Fighting Falcons in October 1989. These were of the block 15 type, replacing the F-4D in the air defense and attack roles. The block 15 aircraft were not ideally suited to the squadron's dedicated air defense mission. This was remedied when the aircraft received the Air Defense Fighter (ADF) upgrade in 1990. Effective 16 March 1992, the 144th Fighter-Interceptor Wing was re-designated as the 144th Fighter Wing (144 FW), with all related Fighter Interceptor Groups and Squadrons becoming Fighter Groups and Fighter Squadrons. On 1 June 1992, following the disestablishment of Tactical Air Command (TAC), the 144 FW was reassigned to the newly established Air Combat Command (ACC) under First Air Force. During this time the 194th Fighter Squadron also had an alert detachment at George AFB in Victorville, California. George AFB was closed in 1992 due to BRAC action as part of the overall downsizing of the US military after the Cold War and the alert detachment moved to March Air Force Base, since renamed as March Air Reserve Base due to a later BRAC action. In 1995, the squadron transitioned to the more capable F-16C Fighting Falcon Block 25 aircraft. The 144th Fighter Wing was the busiest dedicated air defense wing in the country during 1999, with deployments to eight countries and more than a half-dozen states. Combat training had many highlights throughout the year. Fifty wing members deployed five F-16s to Naval Air Station Fallon, Nevada, to participate in the Navy's annual joint combat training exercise. Members of the unit also traveled to Tyndall AFB, Florida for Combat Archer which provided an opportunity for live fire weapons training. To top off the year, six dozen members and six aircraft deployed to Nellis AFB, Nevada between 24 October and 7 November for Red Flag. During the opening minutes of the exercise, a 144th Fighter Wing four-ship flight executed a simulated kill against four actual MiG-29s. These were the first-ever MiG-29 kills in a Red Flag exercise. Also in 1999, the 144th Civil Engineering Squadron's Fire Department deployed to Sheppard AFB, Texas for training, and 44 members of the 144th Services Flight trained at Tyndall AFB, Florida. Fifty-five members of the 144th Medical Squadron received medical readiness training at Alpena Combat Readiness Training Center, Michigan. The 144th Fighter Wing started the conversion process to F-15C Eagles from the 120th Fighter Wing of the Montana Air National Guard with the arrival of the first of 21 F-15s on 18 June 2013. The last F-16 departed the 144th Fighter Wing on 7 November 2013, destined for 162nd Fighter Wing. ^ "144th Fighter Wing, California Air National Guard - Home". www.144fw.ang.af.mil. Retrieved 16 August 2016. ^ a b Master Sergeant David J. Loeffler, 144th Fighter Wing Public Affairs (January 2014). "Bigger, faster, more firepower" (PDF). Grizzly. State of California. Archived from the original (PDF) on 2 April 2015. Retrieved 13 March 2015. 1st Lt. Jason Sweeney, California Military Department Public Affairs (18 June 2013). "144th upgrades to F-15 fighters". California Military Department. State of California. Archived from the original on 9 March 2015. Retrieved 14 March 2015. Willon, Phil (2 September 2012). "California Air National Guard's 144th Fighter Wing protects skies". Los Angeles Times. Retrieved 14 March 2015. Those times will be even faster when the wing converts to F-15s over the next year. Dogan, Robert (25 June 2012). "Draft Environmental Impact Statement (DEIS), F-15 Aircraft Conversion 144th Fighter Wing California Air National Guard, Fresno-Yosemite International Airport, Fresno, California (CEQ # 20120144)" (PDF). Region IX. United States Environmental Protection Agency. Retrieved 14 March 2015. Mumma, Linda (18 June 2013). "F-15 Fighter Jet Touches Down in Fresno". KFSN-TV. Fresno. Retrieved 14 March 2015.